Heritage Quay is the place to be when visiting Antigua's capital city of St. John's. The largest and modern of two Quays in St. John’s, Heritage Quay is a shopper's paradise, offering two floors of a wide array of duty and tax free merchandise for travellers looking to cash in on amazing value and savings from retail prices of Europe and USA. Electronics, local music, cigars, liquors, fine crystals & china, designer clothing & footwear, swimwear, sporting equipment, fragrances, skin care cosmetics, fine jewellery, high end watches and other souvenir items are just a sample of the goods available. There is also a wide selection of sports bars & specialty restaurants around to grab a tropical drink after a day of shopping fun; while the night life comes alive with a flicker of cards from a world-class casino and nightclubs always jumping with artists from around the world. Heritage Quay also offers visitors a breathtaking view of St. John's Harbour, which comes alive with local and steel pan music, when cruise ships are docked at the finger piers of the harbour. The complex also houses two hotels and a photo-centre. ABBOTTS JEWELLERY & PERFUMERY Abbott's in Heritage Quay is the authorized dealer for Rolex and carries other Swiss made watches as well as exquisite jewellery collections; adjacent Perfumery they offer the latest selections of fragrances and gift items. CAMERAS PLUS specializes in cameras and accessories, with brands such as Nikon, Canon, Sony, Panasonic, Olympus, GoPro, GoPole and Casio, plus binoculars, scopes, accessories, batteries and electronic gear. ISLAND B-HIVE SPORTS BAR & KENNEDY'S CLUB LTD.is the perfect place to stop for a refreshing drink or a meal when spending the day in the city. QUIN FARARA & COMPANY LTD. is open to both to public and trade we offer a wide range of fine wines, cigars, tobacco and spirits which is second to none in Antigua. They are distributors of many major brands including Bacardi, Moet Hennessey & Perrier. STERLINGS WORLD OF WATCHES located in Heritage Quay is the only boutique totally dedicated to watches, selling the most popular brands. 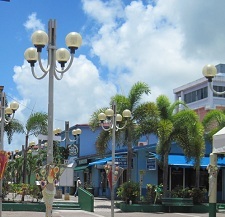 STERLINGS/SHADES is located in Heritage Quay duty free shopping center. You will find that special piece of jewellery or eyewear to suit your style. 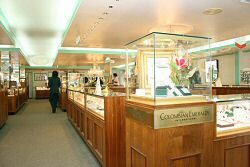 Specializing in silver jewellery but offering much more in 14kt, 18kt and stainless steel, including Pandora, as Antigua's exclusive retailer. They also have a wide selection of sunglasses including Gucci, Dior, Oakley & much more. THE LAND SHOP is conveniently situated in Heritage Quay St. John's & stocks LAND Leather Collections which are made from only the highest-quality leather and hardware. Their collections include items for men, women & children, Leather wallets and accessories, Handbags, Travel Items and Briefcases and more. Remember your Caribbean vacation in Antigua and Barbuda is not complete without a visit to the Heritage Quay (Duty-Free) Shopping Complex in St. John's. ADDRESS: Hertitage Quay, St. John's, Antigua.